Few people deserve to be the face of American currency more than Harriet Tubman. She is a fierce and universally recognized symbol for liberty, whose contributions to protecting our nation’s fundamental principles are paralleled only by her contributions to our nation’s understated history of black, female badassery. She is our nation’s most celebrated female war hero, as well as a personal hero of mine. In one of my favorite incidents in American history, Tubman decided to undergo open-skull brain surgery to alleviate a childhood injury when she was in her 70s—she refused anesthesia, instead deciding to bite down on a bullet, like she saw Civil War soldiers do when their limbs were being amputated. This is all to say, our nation will gain a lot from having Tubman grace the 20 dollar bill, replacing President Andrew Jackson. There’s similarly a lot to be gained in honoring the slew of other figures who will be featured on new bills: Susan B. Anthony, Elizabeth Cady Stanton, Sojourner Truth, Lucretia Mott, and Alice Paul on the back of the $10; Martin Luther King Jr., Eleanor Roosevelt, and Marian Anderson on the back of the $5. But this is little consolation for the deprivation of liberty that these figures and the demographics they represent have suffered in America, and it is ultimately emblematic of a nontrivial, even arrogant endeavor to sanitize history on a large and visible scale. I’ve written on this subject before, specifically in response to the Harvard administration’s decision to rename the title of House Master. Alumnus David Lowenthal '44 aired similar concerns with the title change and related gutting of the Harvard Law School seal in a Crimson op-ed just this week. At first glance, the issue of rebranding currency seems altogether different from the recent streak of historical purging at Harvard—unlike a title, a seal, or a building, money does not have obvious historical value, bearing more significance as a commodity than an artifact. And to the extent that money does have an accessible history, Tubman is as relevant to it as Jackson. With the exception of Alexander Hamilton, the father of the modern financial system and face of the 10 dollar bill, the current figures gracing our currency have little logical connection to the history of money beyond their service to our nation in general. But the underlying reasoning behind this momentous overhaul of the design of American currency is all too familiar: Whatever little or arbitrary history that money represents is not palatable to the people, and so the people are revising it. Andrew Jackson was a vile slave-owning bureaucrat, who the people overwhelmingly—as measured by polling by the popular Women on 20s campaign—want to trade in for Tubman. "The decision to put Harriet Tubman on the new $20 was driven by thousands of responses we received from Americans young and old,” said Treasury Secretary Jack Lew. Yet despite their specious allure, both this idea that our memory of the past should be cleansed of its harrowing realities and this method of crowdsourcing claims to historicity, are problematic. First of all, history is a reflection of timeless truths, not current values. Downplaying the record based on interpretations of today’s zeitgeist undermines this function of history as a comprehensive and ageless spectator. Moreover, history has important pedagogical value. There is power in viewing Jackson as a symbol of slavery and ethnic cleansing. It inspires us to critically examine even the most celebrated figures in history, forever remember the failures of the past, and most crucially, approach present injustices with the fervor and resolve of the millions wronged by history’s most disturbing cruelties. Putting Tubman’s face on a dollar, for example, will do little to combat the fact that for every one a man earns, a black woman only earns 64 cents. It takes courage to stand athwart history’s frustrating tendency towards self-correction—a fraction of the courage of Harriet Tubman and the others who will soon adorn our dollars, but courage nonetheless. But I hope I’ll find this courage in those who, like I, oppose these changes on our currency, who can separate their feelings about a remarkable woman from this distressing decision and find value in history’s bleakest moments. 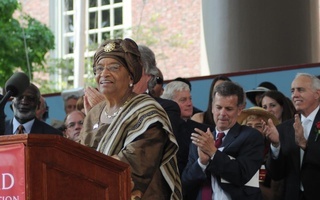 Two Harvard graduates who maintain strong ties to the University are competing for the presidency of Liberia. As we applaud this change and continue working for more nuanced commemorations of American history, we must remain vigilant against inequity in our own time. The challenge of ensuring that history’s weight is carried forth through lessons is both universal and distinctly local.